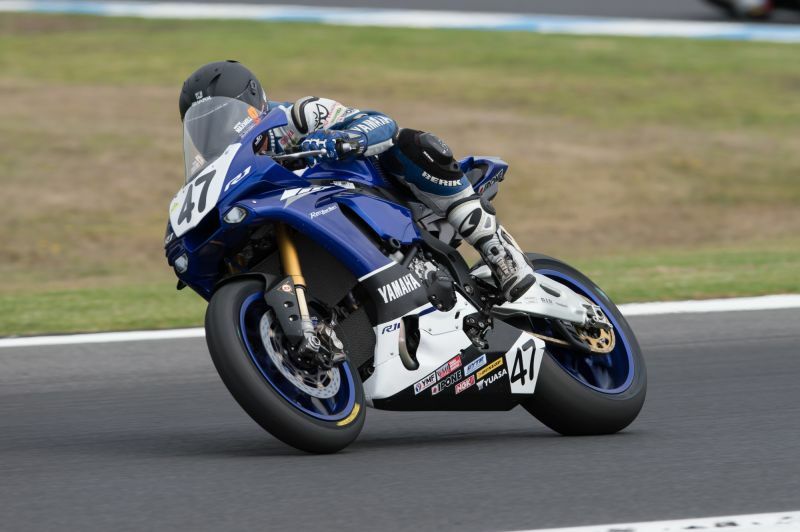 Yamaha Racing Team’s Wayne Maxwell scored the overall round win with an empathic 2-1 result at the fourth round of the Australian Superbike Championship (ASBK) at Barbagallo Raceway on the first weekend of June. The WA win now makes it two in a row for Maxwell as he also takes control of the points lead in the Superbike Championship. Maxwell, 33, described the weekend as an up-and-down and challenging weekend because he struggled to find a setting for his Yamaha YZF-R1M machine. “I couldn’t get a feel for the bike and couldn’t get a direction,” explained Maxwell at the conclusion of the round on Sunday. After starting from second place in the grid, Maxwell sat in second place for the first two laps in race one before making his way to the front of the field on lap three and held onto the lead until lap ten. The Victorian rider threw everything he had at race one winner Mike Jones, however when Maxwell had an opportunity to pass him into turn six Maxwell had to yield as there was a yellow flag out. In the end Maxwell finished second, just .307 second behind. Race two saw Maxwell hitting the lead on lap five and managed to hold the lead all the way to the very end of the twenty lap journey. On his way to victory, Maxwell posted the fastest lap of the race on lap four which was a 55.449, just .003 seconds off YRT’s supported rider Daniel Falzon’s lap record which he set in race one. Thanks to his win it has seen Maxwell take command of the championship fight, which now sees him leading by five points over Allerton. Allerton, who started the weekend off strong admitted that it was a bitter pill to swallow to be third overall for the round as he started the weekend off very well. The Wilton based rider topped the time sheets in practice two and three on Friday and qualifying two on Saturday before qualifying in third place in superpole, .246 seconds off Maxwell’s 55.159 second lap time. After a tough start in race one, Allerton managed to get himself back up to third place and described that race as being "difficult". In race two, Allerton powered his way through the pack from fifth place before making his way up to fourth on lap three, then third on lap four. He would stay there until lap seventeen after he got by Jones into turn seven and held onto second place for the rest of the race. The finishing order between Allerton and Maxwell was .899 seconds. Finishing in sixth place overall with a 7-6 result was the third of the Yamaha riders in Cru Halliday. Barbagallo Raceway was a new circuit for the Camden based rider and it took a while for Halliday to get his head around the 2.411km circuit. At the beginning of the first practice session on Friday, Halliday’s lap time was a 56.466 second. By qualifying one the 28-year-old got into the 55’s by stopping the clock with a 55.863 second. His best lap time however came in superpole when he set a 55.649, which saw him qualify in sixth place. Race one unfortunately wasn’t a good race for Halliday. He did manage to get a good start, however he made a pretty big mistake coming out of the first corner and lost a couple of positions. On top of that Halliday admitted that he made a setup which didn’t go his way. For race two Halliday and the Yamaha Racing Team went back to the setup to what they had in qualifying on Saturday. After the change, Halliday was able to fight hard which was proven when he set a 55.671 second lap time on lap two, which was just .022sec off his superpole lap time. 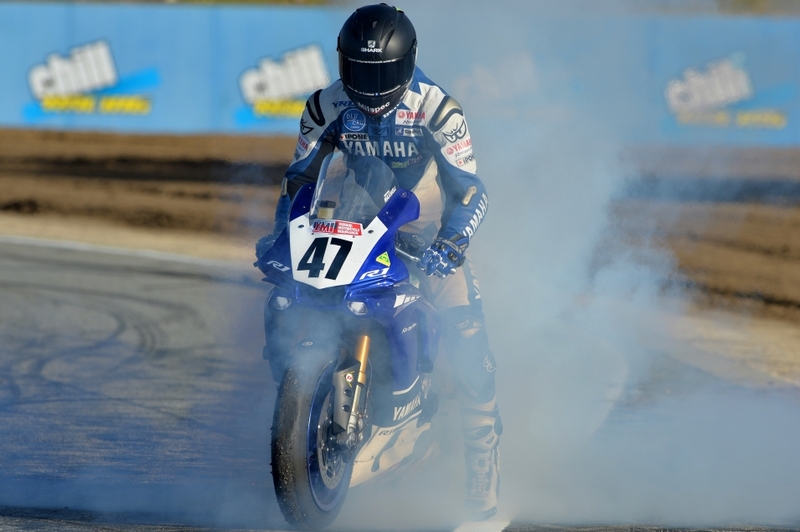 “The Yamaha R1M was handling so well out there in race two,” said Halliday. “I did have a little bit of tyre wear mid-race, but it did come back towards the end of the race. I made a small mistake while fighting against Troy, but these things happen and its racing. I just have to take the good with the bad and head off to Morgan Park now and try and get a good result there. The Australian Superbike Championship now heads to Morgan Park Raceway, which will take place on the first weekend of August. 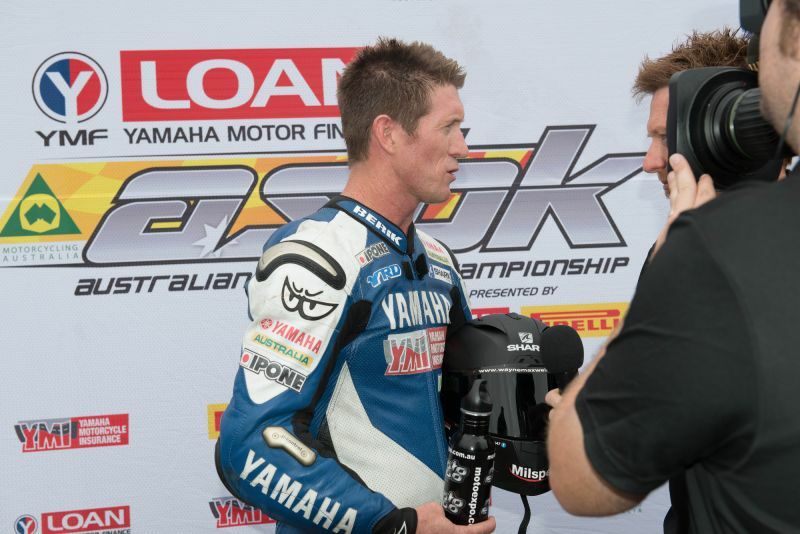 The third stop on this year’s Australian Superbike Championship (ASBK) calendar was at Sydney Motorsport Park and it was a red letter day for the Yamaha Racing Team (YRT) with Wayne Maxwell dominating the day with the perfect 1-1 scores ahead of team mate Glenn Allerton with 2-2 results. From the moment the bikes hit the track on Saturday, the pace was a clear indication that all three riders were going to be hard to lock down and beat around the 3.93km Gardner GP Circuit. Wayne Maxwell topped the qualifying time sheets just ahead of team mate, Glenn Allerton with Cru Halliday lurking in fifth place. Racing proved what timed qualifying produced with Maxwell and Allerton clearly the class of the field. The pair produced some world class racing as they shadowed each other for the entire length of race one while rain was the only thing to separate the duo in race two. Race one saw Maxwell take command of the twelve lap race after hitting the lead at turn two and from there was never headed. He fought off several attacks from Allerton as he held his nerve under extreme pressure from Allerton who was all over the back tyre of Maxwell. As they charged onto the front straight at SMSP, Maxwell tucked in and managed to cross the finish line just .219seconds ahead of his team mate. Cru Halliday came back from a couple of mistakes to claim fourth and make it an impressive 1-2-4 finish for the YRT crew. Race two was held in inclement weather, the first rain affected race of the season but no-one, including Allerton, had an answer for Maxwell as he just bolted away at the front winning by a massive 14.110sec from Allerton. 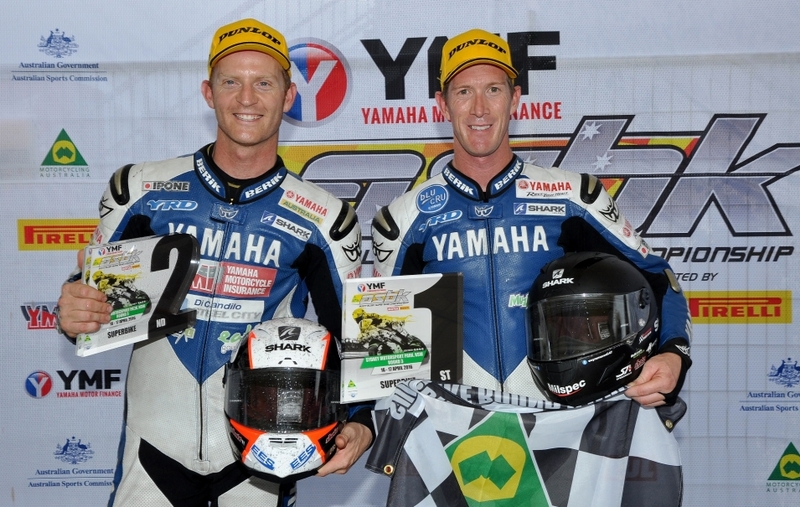 It was again another 1-2 finish for Yamaha. Unfortunately, the wet weather proved a little more difficult for Cru Halliday who doesn’t have the experience in the slippery conditions as his team mates. Halliday slipped back to 13th place in race two, electing to keep his machine on two wheels and gain some championship points. “I was really enjoyed the weekend, especially race two,” Maxwell said. “I felt very relaxed. The Yamaha R1M was fantastic and working really well. What can I say, you have days where everything just clicks and you have days where it doesn’t. The challenge is anyone can win on a good day, it’s trying to win on a bad day. We proved that at Wakefield Park that we could win on a bad day and today we have proved that we can win on a really good day. “Second place today was a great result for myself and the Yamaha Racing Team,” Allerton said after race two. “To get a one-two in both races and the overall is fantastic. I felt like I could have won the first race, however, Wayne was just too good and didn’t make a mistake all race long. From Sydney Motorsport Park, the Australian Superbike Championship now makes the 3,934km long haul to the west to Barbagallo Raceway which will take place on 3-5 June. 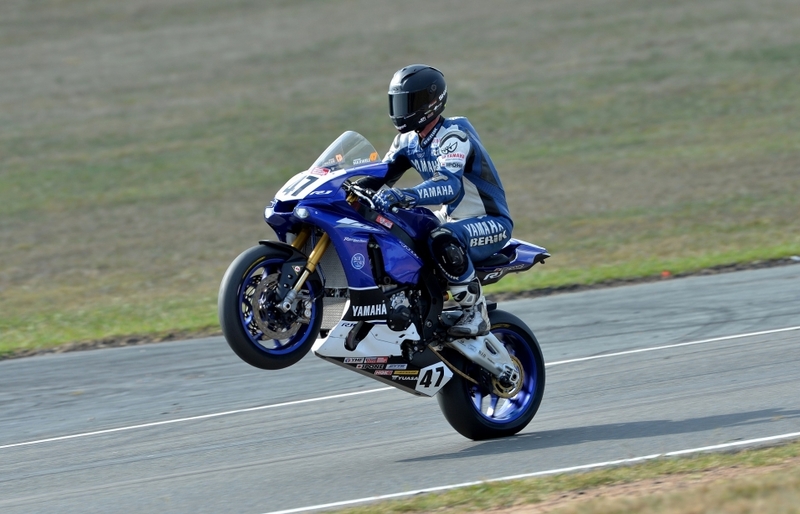 It was mixed results for Yamaha Racing Team (YRT) at the second round of the Australian Superbike Championship (ASBK) at Goulburn’s Wakefield Park, New South Wales on the weekend. All three riders suffered falls from their machines over the course of the weekend but continued to fight on despite the drama and post some respectable results in what was action packed weekend of racing. Race one proved to be one of the most dramatic in some time with three red flags, three re starts and then two race leaders going down before the race was over. Wayne Maxwell led the YRT charge on the weekend and started brightly with P2 in qualifying and confident of a good result in racing. All kinds of drams unfolded in race one with Allerton assuming the lead and Maxwell tucked in behind. Allerton fell at turn five leaving Maxwell to control the race but on the very next lap, he copied Allerton in the exact same turn and both YRT riders were down in the same corner. The former Australian Superbike champion bounced back in race two to take a flawless 5.179sec race two victory to pocket a healthy twenty-five points. The thirty-three-year-old got a lighting start that he knew was going to be so important. He was never headed leading from start to finish in the sixteen lap race. Despite the challenging day and the seventh place round finish, Maxwell moved five points closer to the championship lead and now sits just 15 points behind series leader, Troy Herfoss. In twelfth place, scoring a solid third place and eighteen points in race two after a coming off in race one was Glenn Allerton. Allerton felt like he was super strong for race day to challenge to win both races, but admitted that he let it get away from him this weekend. Allerton now slips to second place in the championship, two points shy of the championship lead. “That fall in race one was costly but when Wayne did the same thing, it must have been a nightmare for the team. It’s disappointing, but that’s racing. We now head to Sydney Motorsport Park which is my home track. I had a great feeling with the bike at the test, so I’m going to go out there and go even harder.” Allerton commented. Tied with Allerton on the day was team mate Cru Halliday who also scored a third place finish and a DNF. Halliday, who qualified fourth on the grid was unfortunately taken out at turn one in the first of three race stoppages, which in the end saw a complete full race start in the later part of the afternoon. With a drama filled restarted race one, Halliday kept the number sixty five R1M on two wheels to come home in third place and set the second fastest lap time, which was a 57.826 on lap four. In race two, Halliday again was taken out at the first corner on the opening lap, which he later said it was simply out of his control. One positive to take from the week for the 27 year old, he has moved from ninth to seventh in the Superbike championship with fifty-two-points on the board. The Australian Superbike Championship now heads to Sydney Motorsport Park for round three which will take place from 16-17 April. The first round of the ASBK at the Phillip Island Grand Prix Circuit, is well known as being one of the fastest, most picturesque, and action packed rounds on the ASBK calendar, so don’t miss all the thrills and spills from round one, and make sure you tune in. Fox Sports 5 – Round 1, Phillip Island – Saturday, March 26, 2:00am (REPLAY)!